"The life of a bear isn’t worth having a pretty tree." Black bears are making their presence known in southern Alberta's Bow Valley as they try to pack on the pounds for the winter ahead, and it's causing problems for both humans and bruins, alike. According to the Calgary Herald, bears have regularly been visiting the towns of Exshaw, Canmore, Lac des Arcs and Harvey Heights. There have also been a number of sightings over the past two weeks in the Banff townsite, according to the Parks Canada weekly bear report. "There’s a bunch of bear activity related to natural attractants within the town and hamlets in the Bow Valley," Jay Honeyman, human-wildlife conflict biologist with Alberta Parks, told the Herald. 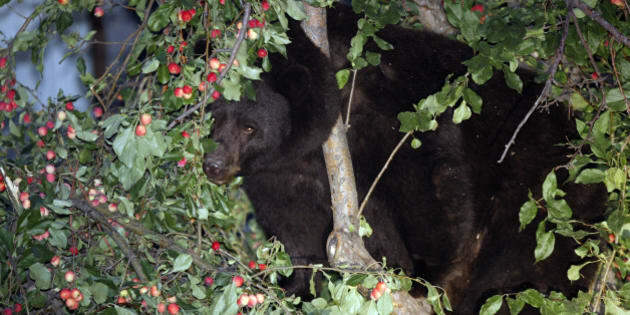 Canmore residents have been urged in recent weeks to either remove crab apple trees from their yards – or, at the very least, pick the fruit as it becomes ripe, after a mother bear and three cubs had to be relocated after they were spotted persistently feeding in residential areas. "The life of a bear isn’t worth having a pretty tree,”"John Paczkowki told the Calgary Sun. Otherwise, he warns, "we'll be seeing more bears leaving town on a truck." One such incident occurred this past Monday, reports the Herald, when a bear was euthanized in the Cougar Creek area after repeatedly getting into apple trees. Paczkowski told the Rocky Mountain Outlook that fruit trees inside town limits are the "last piece of the puzzle" in Canmore's progressive bear management plan. The Town of Canmore does not currently have bylaws restricting fruit trees at single home dwellings. However, several residents have voluntarily agreed to remove their trees. "We’re bound to run into bears this time of year, but hopefully they find it unattractive with less fruit trees around and move back out," Tyler McClure of WildSmart told the Rocky Mountain Outlook. "Every fruit tree left is a gamble, and that’s not a risk people want to take." The Town of Banff will also revisit their fruit tree policy Monday, when council is asked to approve funding for a fruit tree removal incentive program.